Hi Priscilla, I just want to tell you how much I have enjoyed your creations for the last 52 weeks! I love hearing about how you obtained the different beads and the stories behind them. Wow Priscilla, you really have concluded week 52 with a bang! It’s kind of sad to think your weekly masterpieces and stories will not be something to look forward to in 2018. UNLESS!!? I hope you had a great Christmas and Happy New Year. I sent you a couple emails, and when I didn’t get an answer, I thought you might not have gotten them, so I signed up to be on your mailing list, and got this surprising email this morning. Oh my gosh!..you could be my advertising agent! Thanks for all of the thoughtfully kind words and interesting information you included in your email about me. That was a big surprise that made me smile, big time! You are sweet to have included all of those words about me in your mailing. Thank you. You’re sweet! Should you ever want some more centerpieces, let me know….and if not, you certainly have made good use of the ones you have already. I’m so glad we reconnected. Life is flying by, and there seems to be more and more to do. The list gets longer. I jokingly say I’ll have to live to be 105 to complete the list. I’m pleased you are continuing to use your artistic skills…and getting paid for your efforts is whipped cream on top of the cake! Keep it up. I’m not sure I told you, but both of our sons are living here full time, even though one son owns 7 houses in the area, but wants to be here to be with the grand kids who are here 1/2 time,and to spend time with his Father who’s got the onset of dementia. They both are very helpful. Mark rents out our 2 other houses…one on the ocean an one at South Lake Tahoe, and Mike, when not with his kids or working with a contractor, does the repairs around the house. I’m the chief cook and grocery shopper and Henry takes care of the yard. It’s kind of like living in a commune. 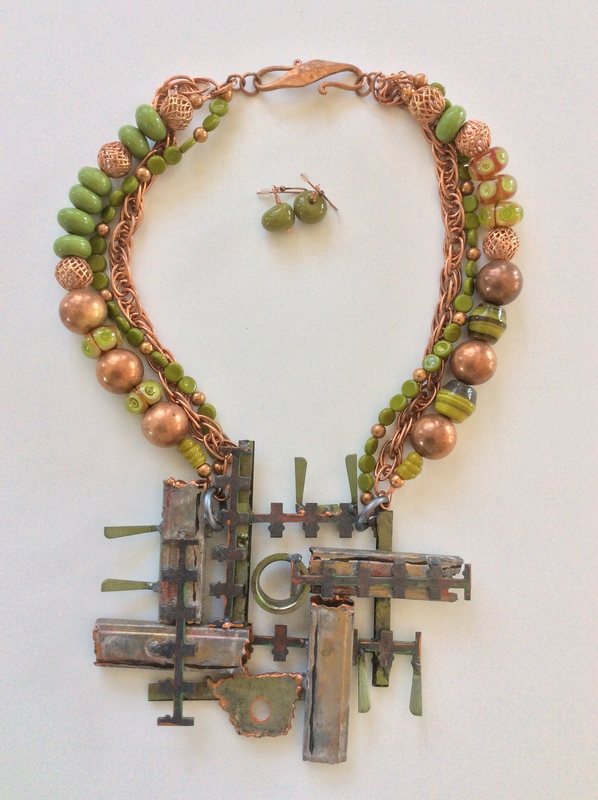 I love your “drawer” story about your necklaces….great idea and most interesting way to talk with your collectors. Keep up the good work and know I so appreciate being back in touch and hearing about your art life. Hugs….and a Happy New Year! Now, what shall 2018 bring? Hooray!! You’ve done it! Congratulations on completing the 52-week project for your 75th year. It’s been wonderful to follow your progress week-by-week, see the next bead art piece, read the next story (and what great stories). Your “final” necklace is suitably colorful and complex – just like you. Congratulations on achieving your goal of a necklace a week! What an accomplishment! I loved seeing your creations! It’s an inspiration and some day I’ll get back into jewelry making! Happy New Year! Hope to see you in 2018!